How well do you know the traditions of the Catholic Church? Take this quiz to test your understanding of the meaning of the symbolism used in the Traditional Holy Mass. don't worry if you don't get them all right. Each answer has an explanation. Why does the Catholic Church use the colour red in eccliastical vestments at certain times of the year? Red signifies the Holy Spirit. Red means hope of salvation. Red signifies the fire of love towards God, and the shedding of blood for the faith. Red signifies the joy and purity of the soul. Red is the colour of humility and penance. In the liturgical langage and architecture of the Church what does the choir represent? A joyful noise unto the Lord. With the high altar, the choir represents the head of Our Divine Redeemer. It represents the voice of the people as they sing hymns of praise and worship to God. It represents the token of our salvation, the cross of Christ. In the vestments of the Catholic Church, what is a girdle? A waist cincture worn by those doing severe penance. 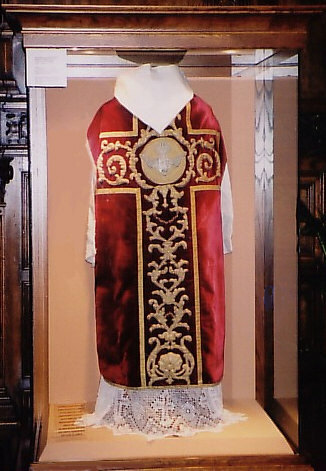 A garment traditionally worn by Catholic women under their dresses. A white cord with which the alb, (a long white linen robe) is bound round the waist of the priest; a girdle is the emblem of purity. What is a Requiem Mass? A Mass said for a special intention, public or private, outside the Office of the day. A Mass for the season, agreeing with the Office of the Breviary. A High Mass celebrated by a bishop with special ceremonies. Requiem Masses are no longer allowed; they are now called Masses of Christian burial. In the traditional language of the Catholic Church, in the Proper of the Seasons, what is the series of Whitsunday? The Sundays between Ash Wednesday and Easter. The entire season between Ash Wednesday and Easter Sunday. The season of Advent in the traditional calendar. The season where no solemnities occur. Why does the Catholic Church use the clour green in its litugical vestments? Green is used to represent our love of Mother Earth and her significance in our eternal salvation. Green is the colour of peace, as represented by the modern Church being one with the environment and nature. Green is the colour of hope in the liturical vestments of the Catholic Church. Green is not worn at all by Catholic priests in the iturgical vestments. Quiz: Are You Smarter Than A Catholic 8th Grader? Morals Quiz: Are You Smarter Than A Catholic 8th Grader?